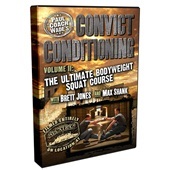 Paul Wade’s Convict Conditioning Volume 3, Leg Raises: Six Pack from Hell explodes out of the cellblock to teach you in absolute detail how to progress from the ease of a simple Knee Tuck—to the magnificent, “1-in-1,000” achievement of the Hanging Straight Leg Raise. Ten progressive steps guide you to inevitable mastery of this ultimate abs exercise. Do it, seize the knowledge—but beware—the Gods will be jealous! 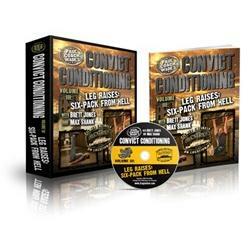 How sure are we that Convict Conditioning, Volume 3: Leg Raises: Six Pack from Hell (DVD) will work for you? Simply fill out the form below and put Convict Conditioning, Volume 3: Leg Raises: Six Pack from Hell (DVD) to work for you right now. 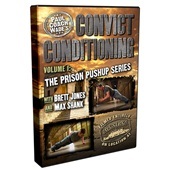 Obviously, we would go out of business if Convict Conditioning, Volume 3: Leg Raises: Six Pack from Hell (DVD) didn't work, the way we said, right? 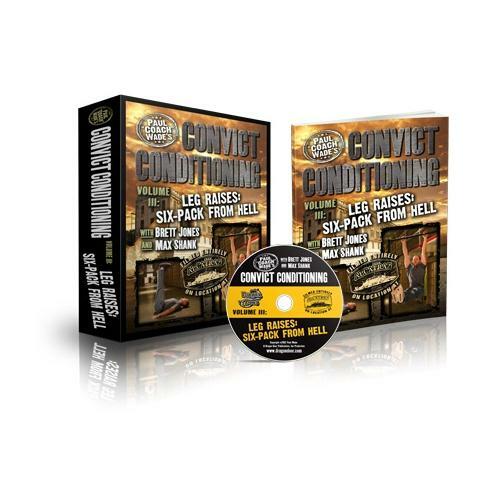 With the promise of a full refund if you're unsatisfied, you have nothing to lose by trying Convict Conditioning, Volume 3: Leg Raises: Six Pack from Hell (DVD). Go ahead and try it today. Filmed entirely—and so appropriately—on "The Rock", Wade’s Convict Conditioning 3, Leg Raises: Six Pack from Hell explodes out of the cellblock to teach you in absolute detail how to progress from the ease of a simple Knee Tuck—to the magnificent, "1-in-1,000" achievement of the Hanging Straight Leg Raise. Ten progressive steps guide you to inevitable mastery of this ultimate abs exercise. Do it, seize the knowledge—but beware—the Gods will be jealous! Paul Wade adds a bonus Ten Commandments for Perfect Leg Raises—which is worth the price of admission alone. And there’s the additional bonus of 4 major Variant drills to add explosivity, fun and super-strength to your core practice. Whatever you are looking for when murdering your abs—be it a fist-breaking, rock-like shield of impenetrable muscle, an uglier-is-more-beautiful set of rippling abdominal ridges, or a monstrous injection of lifting power—it’s yours for the progressive taking with Convict Conditioning, Volume 3, Leg Raises: Six Pack from Hell. When convicts train their waists, they want real, noticeable results—and by "results" we don’t mean that they want cute, tight little defined abs. We mean that they want thick, strong, muscular midsections. They want functionally powerful abs and hips they can use for heavy lifting, kicking, and brawling. They want guts so strong from their training that it actually hurts an attacker to punch them in the belly. Prison abs aren’t about all show, no go—a prison-built physique has to be all show and all go. Those guys don’t just want six-packs—they want six-packs from Hell. And, for the first time, we’re going to show you how these guys get what they want. We’re not going to be using sissy machines or easy isolation exercises—we’re going straight for the old school secret weapon for gut training; progressive leg raises. If you want a six-pack from Hell, the first thing you need to do is focus your efforts. If a weightlifter wanted a very thick, powerful chest in a hurry, he wouldn’t spread his efforts out over a dozen exercises and perform them gently all day long. No—he’d pick just one exercise, probably the bench press, and just focus on getting stronger and stronger on that lift until he was monstrously strong. When he reached this level, and his pecs were thick slabs of meat, only then would he maybe begin sculpting them with minor exercises and higher reps.
It’s no different if you want a mind-blowing midsection. Just pick one exercise that hits all the muscles in the midsection—the hip flexors, the abs, the intercostals, the obliques—then blast it. And the one exercise we’re going to discover is the best midsection exercise known to man, and the most popular amongst soldiers, warriors, martial artists and prison athletes since men started working out—the leg raise. You’ll discover ten different leg raise movements, each one a little harder than the last. You’ll learn how to get the most out of each of these techniques, each of these ten steps, before moving up to the next step. By the time you get through all ten steps and you’re working with the final Master Step of the leg raise series, you’ll have a solid, athletic, stomach made of steel, as well as powerful hips and a ribcage armoured with dense muscle. You’ll have abs that would’ve made Bruce Lee take notice! 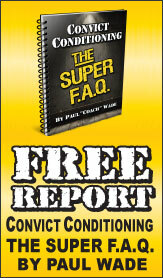 Paul Wade gives you ten key points, the "Ten Commandments" of leg raises, that will take your prison-style core training from just "okay" to absolutely phenomenal. We want the results to be so effective that they’ll literally shock you. This kind of accelerated progress can be achieved, but if you want to achieve it you better listen carefully to these ten key pointers you’ll discover with the DVD. Bodyweight mastery is a lot like high-level martial arts. It’s more about principles than individual techniques. Really study and absorb these principles, and you’ll be on your way to a six-pack from Hell in no time. The hanging straight leg raise, performed strictly and for reps, is the Gold Standard of abdominal strength techniques. Once you’re at the level where you can throw out sets of twenty to thirty rock solid reps of this exercise, your abs will be thick and strong, but more importantly, they’ll be functional—not just a pretty six-pack, but a real monster of an athletic core, which is capable of developing high levels of force. Hanging will work your serratus and intercostals, making these muscles stand out like fingers, and your obliques and flank muscles will be tight and strong from holding your hips in place. Your lumbar spine will achieve a gymnastic level of flexibility, like fluid steel, and your chances of back pain will be greatly reduced. The bottom line: If you want to be stronger and more athletic than the next guy, you need the edge that straight leg raises can give you. 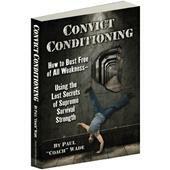 Seems like a good course, I agree with Pavel /And Author in taking one good exercise and working the .... out of it. And I've gotten tremendous results from leg raises on parallel bars .